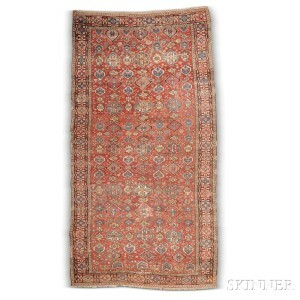 Skinner to Offer First Online-only Auction of Fine Oriental Rugs & Carpets, October 13 – 21 | Skinner Inc.
A private collection of antique rugs leads the auction. Formed in New York City during the 1950s and 1960s, the collection is like a time capsule of refined, eclectic taste. 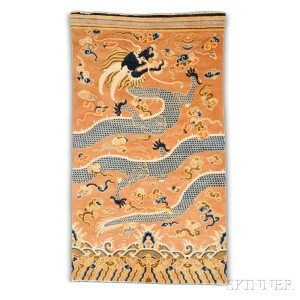 It contains a number of early, good condition Chinese rugs, such as a classic early 19th century Pillar Rug (Lot 92, estimated between $1,500-2,000), a group of 18th and 19th century Turkish prayer rugs, highlighted by a particularly beautiful Mudjar (Lot 100, $2,000-2,500), and several first-rate 19th century Persian workshop rugs, including a striking wool and silk Sarouk prayer rug (Lot 175, $2,000-2,500). Also on offer are a selection of pieces from the Arlene C. Cooper Collection of early Kashmir and European Shawls, including a mid-18th century Mughal shawl end panel (Lot 63, $1,000-1,500) and a number of Central Asian rugs and textiles, featuring two complete early 19th century Tent Bands (Lots 79 and 80, each $3,000-4,000). A strong selection of Caucasian rugs is also featured, the most notable of which is a complete 18th century South Caucasian Carpet (Lot 115, $5,000-6,000). Filled with the archaic style of ornamentation only occasionally seen in later pieces, this grand carpet embodies the culmination of a great design tradition going back to the 16th century. Also of note are (Lot 118, $3,000-3,500) a powerful, excellent condition, 1870s “Tree” Kazak carpet, (Lot 120, $3,000-4,000) an early Borchalu Kazak in very good condition, and (Lot 121, $4,000-5,000) a full-pile green field Kazak, dated 1884. Just to the south of the Caucasus is the Moghan Plain of Northwest Persia, where the wonderful 19th century Shasevan Jejim originates (Lot 137, $1,500-1,800): filled with camel trains, the design celebrates a nomadic way of life that depends upon the migration of flocks and people from winter to summer pasturage. In a similar spirit, the folky little Bakshaish rug (Lot 29, $1,200-1,500) with a single tree in a field, combines powerful iconography with playfulness. A large group of fine silk Persian city rugs from the 1880s through the 1950s moves to the other end of the aesthetic spectrum, highlighted by (Lot 177, $5,000-6,000) an antique silk Tabriz prayer rug, and perhaps the most luxurious rug in the sale (Lot 171, $15,000-18,000) a fine-weave 1920s silk Hereke carpet, both in excellent condition. A generous selection of over 60 decorative carpets from the 19th and early 20th century round out the auction, highlights include (Lot 156, $10,000-12,000) a sublimely beautiful Serapi, (Lot 424, $500-1,000) a circa 1900 ivory field Ushak, and (Lot 165, $10,000-12,000) a large blue field Bidjar with a classic “Harshang” design. All lots offered at Skinner may be viewed online or in person, and specialists are available to answer questions, setting our auction house apart from internet-based auction companies. Previews will be held in Boston on Thursday, October 20 from 12PM – 7PM and on Friday, October 21 from 10AM – 3PM. 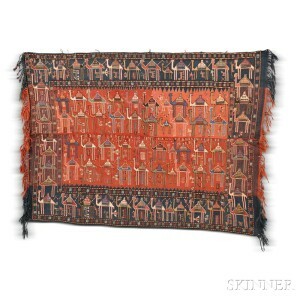 View the catalog at www.skinnerinc.com/auctions, and log in or create an account to start bidding. Specialists are available throughout the auction to answer questions and provide additional information about the lots offered; lots begin a staggered close on Friday, October 21 at 3PM. This entry was posted in News and tagged anatolia, antique rugs, auction, carpets, Caucuses, central asia, China, Fereghan Sarouk, fine oriental rugs, fine rugs, Haji-Jalili Tabriz, India, kashmir, Lawrence Kearney, Mughal, online auction, oriental rugs, Persia, rug auction, serapi, Shakrisabz Suzani, shawls, skinner, skinner auctions, Star Kazak, textiles by Skinner. Bookmark the permalink.